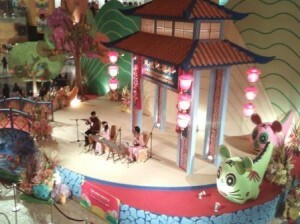 As this year, 2010 is the year of the Tiger, Sunway comes out with a unique design of something that look similar to a kitty cat. 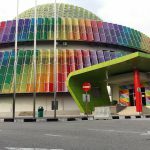 Anyway, decorations aside, I’ve always like Sunway Pyramid since the good old days when it was first opened- the Eyptian design and the ambience created by the brown structure with yellow light makes it nice to walk around. Now, the place’s huge since there are huge blocks of additions around the original complex. The picture above is taken slightly upwards where you can also view the decorations of cloud-like towards the ceiling. 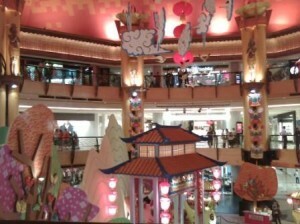 In conjuction with Chinese New Year, a lot of stores are throwing in sales- like Jusco, Parkson and the other boutiques. But because red is not particularly my favourite color, I’ve bought some clothes during Christmas sales. Christmas or year end sale often have the best buys of the year- I think, probably because a lot of retailers are anxious to clear the year’s stock. It is a ‘pantang’ (olden beliefs) that one cannot buy a new pair of shoes during the period of Chinese New Year (lasting 15 days from the new moon to full moon). Some say it is because the pronounciation of “shoes” in Chinese sounds like something inauspicious. Or perhaps it signify walking away? I remember many years ago during one Chinese New Year, I bought a new pair of slippers and got shelling from my mom- that year, I was sent to another state by the government to pursue my higher education. Note: I always that if Jaya Jusco is on sale, their shoes are very cheap and good quality- they have brands like Alan Delon, Crocodile, Scholl, Larrie …sometimes you can find them being on sale 50%- 70%. Above: Taken outside Sunway Pyramid near one of the place where the cars are turning in to the mall to drop off passengers. 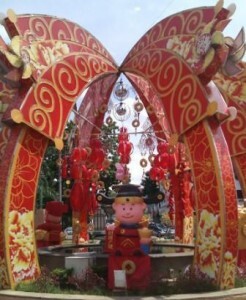 The mini roundabout is decorated with the “choy sun” (Prosperity Deity). By the way, if you are coming on the weekends by car, try to arrive at the parking before 11am because it will be difficult for you to get a parking after that. I arrived close to 11am and the carparks were quickly filling up. By the time it was 12pm, the whole place was literally filled with cars- all the way along the road leading to the shopping complex. 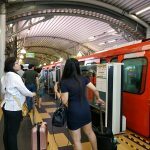 Parking is RM3 for the first 3 hours on weekends and public holidays. 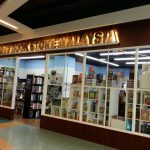 Weekdays is RM1 for the first 3 hours. 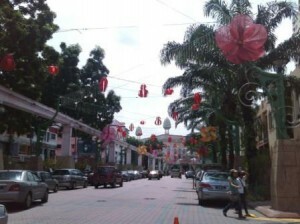 Some people I know who are going to meet friends at Sunway rather take the bus- Metrobus 10 & 11 pass by Sunway Pyramid. 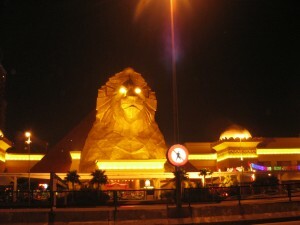 When I have friends visiting from overseas or outstation, I always love to bring them to Sunway Pyramid- the very least to pass by the place at night- and in all cases, they marvel at the magnificience of the Lion Head, pyramid and the overall structure of the entire Sunway complexes.